There are two types of dishes in my kitchen -- the ones that I conceive and the ones that my leftovers conceive. I'd like to think that I am a pretty creative cook and am at least as good at this game as the little containers sitting in my fridge. But I have a feeling they go on long brainstorming sessions while sitting in the fridge for a day or two. I mean, if you were a leftover, how would you spend your time? The leftovers today were sauteed trumpet mushrooms and uncooked haricot verts (the slender little green beans). The original plan was to toss them with buckwheat and caramelized onions until I realized that I ran out of buckwheat. I did find some polenta, and consulted my leftovers about this arrangement. They seemed to be pretty happy to go on top of polenta, but suggested adding some tomatoes and maybe even a little porcini stock to bring out the mushroom flavor. Luckily, I had some dried porcini mushrooms and couple of cans on Muir Glen tomatoes in my pantry. It sounded like a good plan, and I set to work stirring my pot of polenta and cooking the sauce. I wonder when KitchenAid or All-Clad will come out with a self-stirring pot. It would come in so handy. But polenta only takes about 30 minutes, so I can't complain too much. It must have seemed longer since I just got back from the gym and was starving. 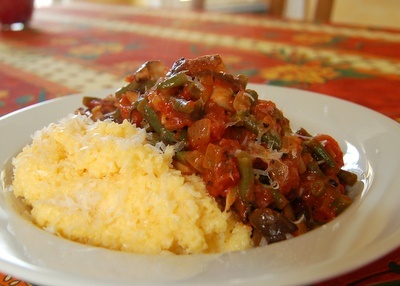 Finally, the polenta got nice and thick, the beans got tender and it was time to eat. Yum! Those leftovers have some awesome ideas sometimes. All the mushrooms are optional. If you are not using dried porcini liquid, don't drain your tomatoes to end up with roughly the same amount of liquid. Put porcini in a little bowl and cover with 1 cup boiling water. Let sit 15-2o minutes while preparing the sauce. Set a large skillet oven high heat, add 1 Tbsp olive oil, fresh mushrooms, and a pinch of salt. Cover, turn down the heat to medium-low, and cook until tender, 5-7 minutes. Uncover, turn up the heat to medium-high, and cook stirring occasionally until golden brown, 5-7 minutes. Remove to a bowl and set aside. Add the remaining 2 Tbsp olive oil, onion, and a pinch of salt to the skillet. Turn down the heat to medium-low and cook stirring occasionally until onion is translucent and starting to brown, 8-10 minutes. Add garlic and green beans and cook stirring for 1-2 minutes until fragrant. Strain porcini liquid into a bowl through a strainer lined with paper towel to remove the sand. Add porcini liquid and tomatoes to the skillet with beans and bring to a simmer. Cover the skillet. How long to cook the sauce depends on how hungry you are. Ideally, turn down the heat to low and cook for 45-60 minutes. The goal is to get the green beans to be very tender. I know that mushiness is not normally a desired quality in the bean, but trust me on this one -- they are really good this way in tomato sauce. If you are as hungry as I was today, you might cut some corners, and crank up the heat to medium for 10 minutes and then medium-low for another 10. The beans won't get quiet as tender, but the sauce will thicken and be still very yummy in just 20 minutes. Right before serving, stir in the butter, add salt to taste, and take off heat. Add polenta in a steady stream stirring constantly with a whisk. Cook for 30 minutes, stirring constantly. As polenta gets thick, switch to a wooden spoon. If you like yours on the thinner side, add water a few tablespoons at a time as polenta thickens. Stir in butter and 2 Tbsp parmesan. Divide between 4 bowls, top with the sauce, and sprinkle with remaining parmesan. There actually is a pot-stirring gadget, believe it or not. It's called StirChef. Pesonally, I tend to be wary of anything whose primary container label says "As seen on TV!" That looks so excellent! Making polenta from scratch is hard work, but worth it (sometimes). I will add this recipe to this week's gluten-free roundup! BipolarLawyerCook: wow, who knew that was a pot stirring device. It does looks too good to be true, particularly with "as seen on TV" label. But you never know -- immersion blenders were first "seen on TV" too. I guess I'll wait until Cook's Illustrated evaluates a few of these things before I consider buying one. Turning leftovers into something this wonderful is an art. It's also a big step in the evolution of a cook. For me, the first big "Aha!" moment when I started getting more serious about cooking was looking at a recipe and having a pretty good idea what it would taste like before I even started cooking it. Next came, "I bet it would be better if I..." That was followed by borrowing a technique learned from a recipe and applying it to a completely different set of ingredients. And now, one of my biggest pleasures [and accomplishments, I think] is to be confronted with some ingredients, leftover or otherwise, and actually come up with a couple of different interesting approaches to cooking them, possibly adapting the plan as the dish progresses, as you did. 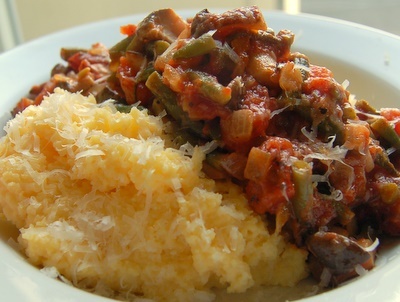 This polenta dish is a shining example of that kind of satisfying cooking, Helen. I think you hit the nail on the head with "having a pretty good idea what it would taste like before I even started cooking it." It's the ability of conjure up a taste in your head that is so necessary for cooking experimentation. i don't know why they don't make these for kitchens, but they make a self-stirring device for labs. there's a hotplate with a spinning magnetic bar under it and you just put a magnetic stir bar in the pot, put the pot on the hotplate and it stirs and cooks at whatever temperature and speed you want. we need to start a petition or something to get these sold at target. This sounds excellent. I'll sign the petition. Didn't sous-vide (sp?) technique originate in science labs too? What's more fun than playing with leftovers? Sometimes it's fun to cook a bunch of stuff on the weekends just to create leftovers, to stack up little containers in the fridge, and to pull them out at random and invent new dishes all during the week. It's funny -- I do that too -- create leftovers intentionally. When I interned in a restaurant, that's what restaurant cooking felt like. You had all these different containers with different side dishes, sauces, marinades, drizzles, and prepped veggies. When a customer ordered something, you simply pulled it all together into one dish. It looked like really sophisticated, New American cooking that had all these different components, but when you see it in its little containers, it totally feels like cooking with leftovers. I'm probably the only one here who hasn't had polenta. Guess I have to try it - you've made this dish look delectable. You are not the only one new to polenta. I've had it in restaurants many times, but haven't started making it at home until about a year ago. A heretical suggestion: making polenta turns out to be quite a bit easier if you pour the polenta before the water boils. You can pour much faster, you can use the wooden spoon since the beginning, and you get no lumps anyway. I know, I know: that's not what Tradition says. But then, Tradition also says polenta is made in a copper pot over an open fire, and I don't do that either. At least, heresy is worth a try! P.S. Congratulations about everything, and best wishes: I read you're on to a great 2007! Join anti-tradition club! I only obsess about traditional taste, how you get their doesn't really matter to me. I'll try your polenta technique next time I make it. I Just stumbled on your site and have to say I LOVE how you write about your ingredients talking to each other and to you.